Asparagus is a sweet and tender spring vegetable, considered by many to be a delicacy. Asparagus is one of the few perennial vegetables, and with proper care, the plants will continue to produce for 15 years or more. Although growing asparagus is very different than growing most garden vegetables and involves a bit of a learning curve, caring for asparagus isn't difficult, and requires little maintenance once the plants are established. Water asparagus plants often during the first two years after planting. Water the asparagus plants deeply by allowing a hose to trickle at the base of the plants, or use drip irrigation. The soil should be wet to a depth of 4 feet after each watering. Control weeds in the asparagus bed, as weeds will compete with the asparagus for moisture and nutrients in the soil. Pull weeds by hand, or carefully cultivate the top of the soil with a hoe. 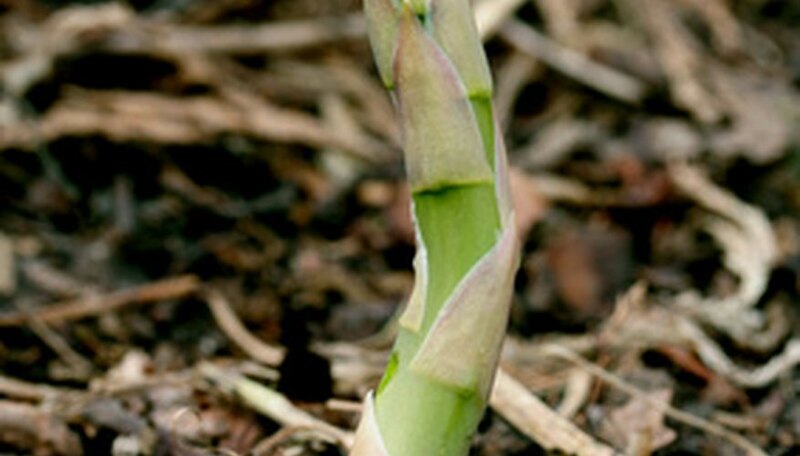 Harvest the asparagus spears once they reach 6 to 8 inches by snapping or cutting the stalks at ground level. Avoid pulling the spears, as doing so can harvest other spears. Harvest the asparagus the second year after planting, but only for a period of no longer than two weeks. Harvesting too much asparagus too early will weaken the plants. After the second year, healthy asparagus plants can be harvested for six to eight weeks. Allow weaker plants to grow an extra season before attempting to harvest. Snap all of the remaining asparagus spears off at ground level when harvest is finished for the season. Harvest should be stopped when the diameter of most of the spears is 3/8 inch or less. Fertilize asparagus plants after the last harvest of the season. Use a balanced, granular fertilizer applied at a rate of 1 lb. for each 100 square feet of planting area. Repeat in spring just before the asparagus spears begin to emerge from the ground.